Currently, in some countries are Representatives of the Bunyoro-Kitara Kingdom. 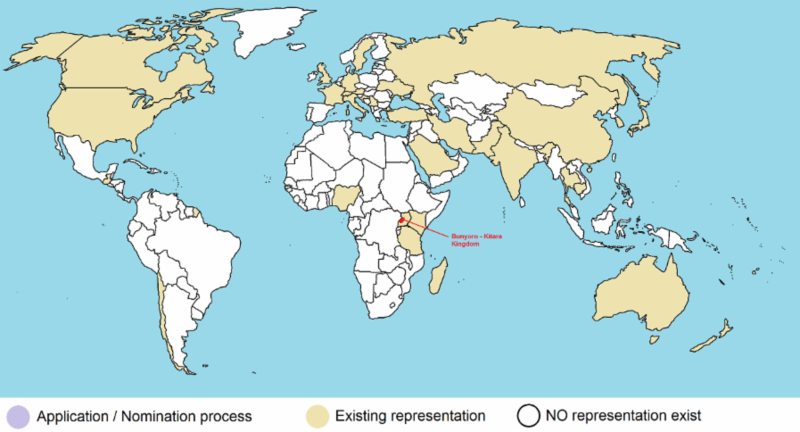 The declared goal is to have in each country a representative and representatives of all levels. This is an exciting time for the Association of the Representatives of the Kingdom of Bunyoro-Kitara, worldwide! (ARKBK) CLBG, as we prepare to launch an ambitious plan to significantly increase our impact and reach even more countries and more people across the world. As part of this effort, we are growing our representations / missions at both the international and the national levels. As we build out our representations / missions, we are seeking individuals who are goal-oriented and operate with high levels of urgency and personal responsibility for achieving ambitious outcomes; thrive in achievement-oriented, entrepreneurial, and fast-paced environments; have a strong belief in the power of high expectations on achievement; and are passionate about reducing the educational achievement gap, the poverty and improve the living conditions in our Bunyoro-Kitara Kingdom. Association of the Representatives of the Kingdom of Bunyoro-Kitara, worldwide! (ARKBK) CLBG encourages individuals of all ethnic, racial and religious backgrounds to join in achieving the cause. Representatives are Representatives -therefore "representative"-, they enjoy no immunity. Our only goal and our mission are to improve the living conditions and human development in Bunyoro-Kitara Kingdom and not to like or dislike the other representatives. We must all work together and not against each other! We must do everything TOGETHER, what we can do to improve the living conditions of the Banyoro. That must be our main task! Our own interests must stand far behind the interests and the life of the Banyoro and the Bunyoro-Kitara Kingdom. That’s called “Humility towards the people”. As a person and official we are at the end of the ranking / hierarchy; we are servants of the people and the Bunyoro-Kitara Kingdom!